> Research Library > HotSchedules > Is Your Restaurant at Risk Over Labor Compliance Violations? There’s no two-second rule when it comes to the law, and in today’s legal environment, maintaining compliance is crucial now more than ever. 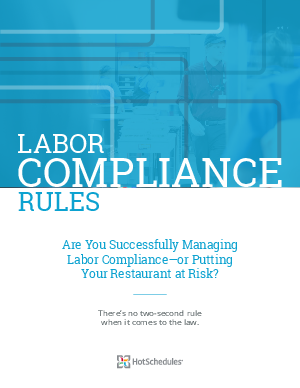 This ebook provides an overview of the labor laws that impact restaurants today and the high cost of non-compliance. It also presents the features of an automated system that gives restaurants the capabilities they need to meet today’s increasingly complex labor compliance regulations—so they can avoid the high price of non-compliance and create work environments that better serve their employees’ needs and rights.